First exhibition and e-commerce launch of hand embroidered shawls made by BISP beneficiaries being organized in collaboration with AHAN and TCS will continue till Friday at Lok Virsa, Islamabad. 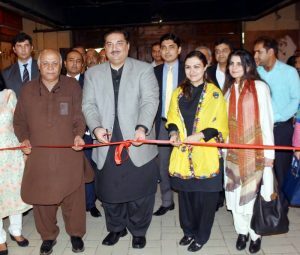 Commerce Minister Mr. Khurram Dastgir Khan has inaugurated the exhibition. He says e-commerce technology will bring an era of development and prosperity in Pakistan. BISP & AHAN’s joint initiative with help of TCS will prove as remarkable step towards poverty alleviation.